The Most UpMarket Home Address? Marina Bay and its vicinity look to be deposing the District 9 Orchard Road area as the place to live in. Its work-live-play concept is taking hold of the imagination, and mega-office complexes like the Marina Bay Financial Centre and Asia Square Tower are drawing expatriates to luxury homes in the financial district. Luxury apartment prices in the District 1 Raffles Place, Marina Bay, and Cecil Street areas, and in areas like Anson and Tanjong Pagar in District 2, are outperforming the overall Core Central Region (CCR) in the first 3 months of 2018. Prices in these 2 districts went up 9.3% year on year to S$2,147 PSF, compared to a 6.2% rise to a record S$2,046 PSF in the CCR, which also includes Districts 4, 9, 10 and 11. That pricing is close to the peak of S$2,207 PSF in the 1st quarter of 2013. Sales at projects such as Icon, Wallich Residence, Lumiere, and 76 Shenton, pushed District 2 prices up 14.5% year on year in the 1st quarter of 2018, while District 1 saw a 5.6% rise, due mainly to The Sail @ Marina Bay and One Shenton. People mostly think about the Orchard Road and Nassim areas when it comes to luxury homes, but District 2 is coming up as the new place where investors are paying top dollar. New apartment home prices in these two districts – which also include Boat Quay, Shenton Way and Chinatown – hit an all time high of S$2,653 PSF in 1st Quarter 2018, 5% higher than the S$2,526 PSF recorded for the 4th Quarter of 2017. Subsale prices rose to a record S$2,319 PSF, about 18% higher than the S$1,963 PSF recorded for Q4 2017. Resale prices held firm at S$1,875 PSF. Across the island, the second and third priciest homes sold in Q1 2018 on a PSF basis are at Wallich Residence. An 89 sq m unit there transacted at S$3,894 PSF, and a 160 sq m unit at S$3,832 PSF. On a volume basis, 89 caveats were recorded in Q1 2018 in the two districts, above the five-year average of 85 units. For 2017, 493 caveats were lodged vs 195 units in 2016 – despite the rise in average prices. Demand for District 1 and 2 homes have risen since the launch of Icon by Far East. The completion of the Marina Bay Waterfront Promenade, Gardens by the Bay, The Promontory @ Marina Bay, and Marina Bay Sands, have helped pull in buyers especially expatriate singles and young couples. The path along the waterfront that links up Marina Centre, Collyer Quay and Bayfront, offers residents paranomic views of the promenade, as well as direct access to malls like Marina Bay Sands, Marina Square and Suntec City. These are key factors, as lack of such amenities have in the past turned buyers towards luxury homes in the Orchard, River Valley, and Newton areas instead. The completion of several offices at the Marina Bay Financial Centre, Ocean Financial Centre and Asia Square Tower, have drawn expatriates to rent homes in these 2 districts as well. Prior to Marina Bay, the traditional CBD (Central Business District) was mainly commercial in character. But when Marina Bay opened, its concept of ‘work, live and play’ in one place, brought more residents in. 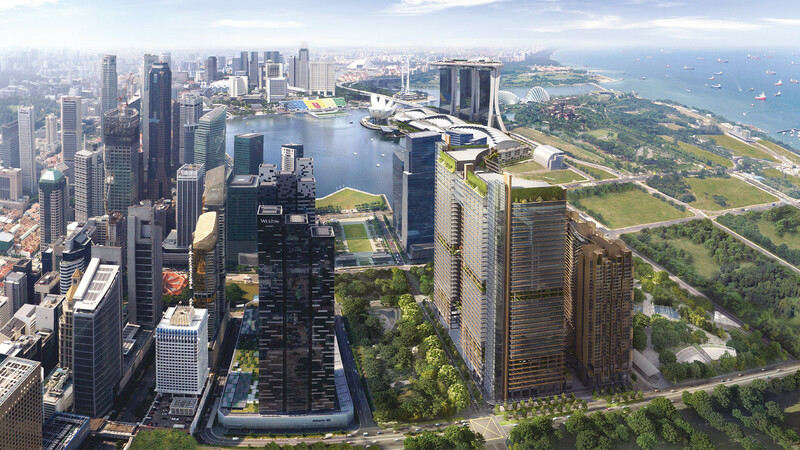 The introduction of white sites via the Marina Bay land sales also enabled developers to establish a residential enclave within the CBD, while some conversions from commercial to residential use were allowed. For example, conversion of Robina House to One Shenton, and Natwest Centre to The Clift. Prices of homes in these two districts are predicted to rise by about 8 to 12% in 2018 as more units from Marina One Residences and Wallich Residence are put on sale.